Cash On Delivery, Fool’s Paradise, Absurd Person Singular… that’s nine months of tough fun. Three plays done and another season put to bed. Now we take our summer break. But that doesn’t mean we are not active. During this time we take stock, get together to read plays every week, have our AGM, have our annual summer meal and decide on our programme for the 2015 / 2016 season. And we’ll keep you updated on here. Our first event is our Open Night. 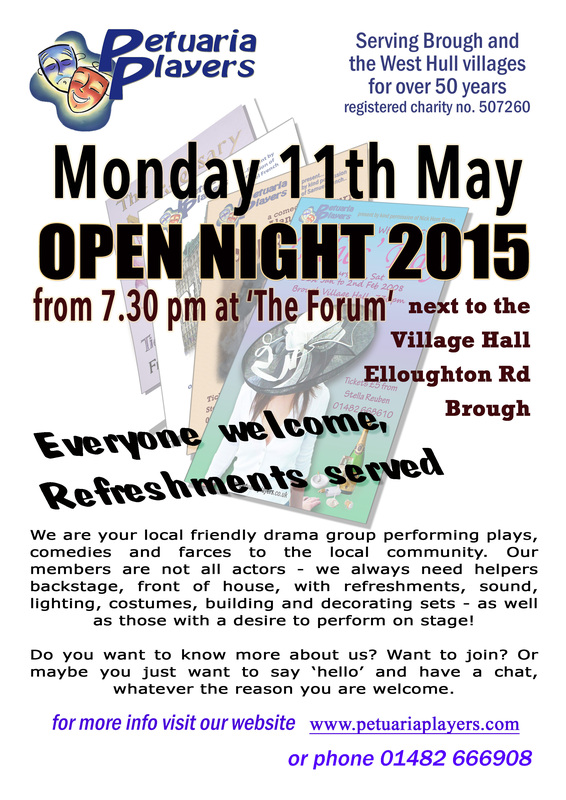 Monday 11th May from 7.30pm at ‘The Forum’ in Brough. This is a chance to come along and meet us, chat, look at our history and maybe consider how you might be able to help us create our productions. And if you can’t make it to that then there are many ways to get in touch with us – just check around this site.